People often ask me where my recipe ideas come from. And I never know what to answer- no, I really can’t answer. Because I simply don’t know. Okay, sometimes I know. I mean, the Butterscotch Bundt Cake that I published in my column in Ami magazine was a dream I had during my commute home from work one day. Okay, so I can’t exactly tell you where the dream came from, but it’s something. And some recipes are carefully researched and created to fit a theme, holiday or inspiration. But this recipe came to my head, completely formed, in a split second. I was talking to my sister-in-law about dessert I would bring for a party she was making. She mentioned a yellow color scheme, so naturally my mind went to lemon. And then, because there’s a cheesecake holiday coming up, my mind went to cheesecake. And in a tenth of a second, this entire recipe appeared, fully formed, in my head. Good news is, it was as delicious in real life as it seemed in my head. And better news, it’s super easy, no bake, and looks really pretty. Can you possibly ask for anything else? In the bowl of an electric mixer, whip the cream until stiff. Remove from the mixer and set aside. (No need to wash the bowl before continuing.) Add the lemon pie filling and cream cheese to the mixer and beat until smooth. Add the vanilla extract, food coloring (if using) and powdered sugar and beat until combined. Using a rubber spatula, add the whipped cream into the cream cheese mixture, slowly (do it in batches), until its fully incorporated. Set aside. To make the crumbs, combine the graham cracker crumbs, sugar and melted butter or margarine. Place a small amount of the crumbs on the bottom of a cup. 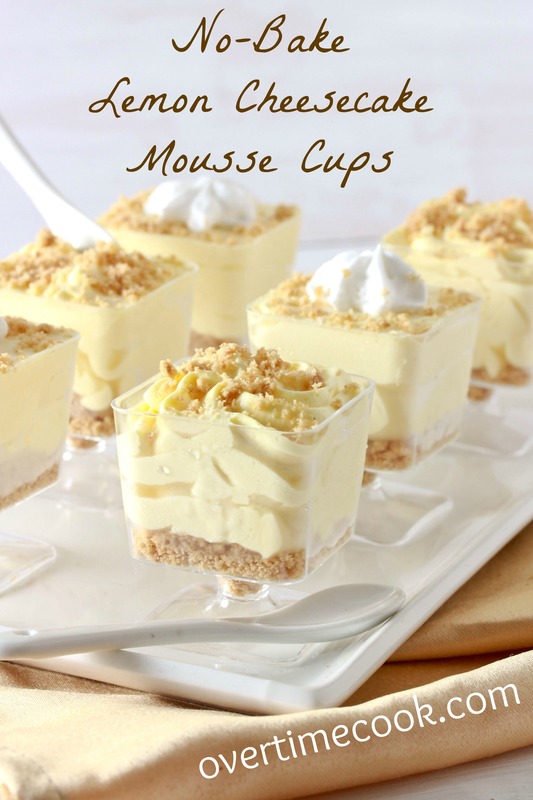 Pipe the mousse over the crumbs to fill the cup, then add more crumbs on top. I made these tonight , only made 10. What size cups did you use to make 30? And should I add more pie filling or some lemon zest to make it more lemony? Thanks. Who cares where the ideas come from when they’re this good! Beautiful photos, Miriam, of a beautiful dessert! These are just as lovely to look at as I’m sure they are to eat. My husband would love these since his favourite dessert flavour is lemon. Wow! These look great. Would love to try them. I made something like this once. Only instead of lemon pie filling, I used vanilla pudding and freshly squeezed lemon juice. And I used lemon pound cake on the bottom, and dried some of the cake to crumble on top. Oh, and I but them in some fancy tall schnapps cups. Could these be piped into mini tart shells? What a beautiful dessert! I love these bite-size desserts. My dad adores lemon desserts! I think I’ll try making this tomorrow morning so he’ll have something scrumptious when he comes home from work. By the way, your creativity is astounding. I would never be able to whip something up like that without guidelines. These look absolutely delicious! I love anything lemony… add in creamy and I’m beyond ecstatic! Love what you did with them!!!!! Some of my best ideas come to me while driving! How would it taste if I prepare the mixture for second day shavuos and assemble right before I serve. Would it taste the same ? So pretty! Absolutely love the square stem dishes. Could you tell me where I could purchase them? Thanks. They sell them at my local grocery store- not sure where online they carry them! A fun treat to make with my 4 year old!!! Thanks for sharing. Wow!!! This looks delicious! I’ve been looking for a good/different dairy dessert and I love the fact that it has lemon too. Can’t wait to try this! Have a great chag! How many cups would this make? I froze this and it make delicious creamy mini ice cream trifles. I’m about to make it so I am going to let you know how it goes……..
Hi i hate this it is,so stupid I burned them iin the oven because it did not show how long to cook them!!!!!! Me too! It calls for no bake, but then again, it says to heat the oven at 333 degrees. WHY! Idk u tell me! 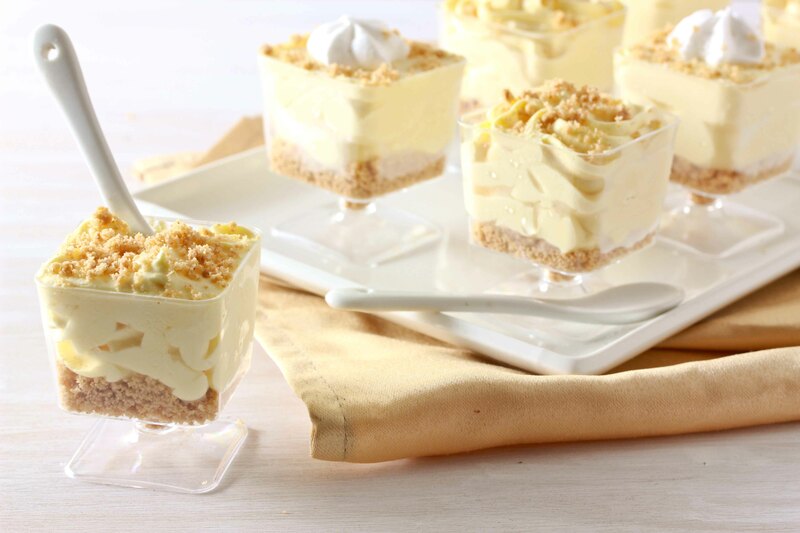 Approximately how many lemon mousse cheesecakes do you get from each recipe? Thanks! About 3 dozen, but it will depends on the size of your cup. Is powdered sugar regular sugar or confectionary sugar? How long will these last in the fridge? I want to make them ahead of time for a party. Thanks! If you make them ahead of time, you’re best off freezing them! Can these be frozen completely assembled? And do you think they would be ok in the freezer for a few weeks? Thanks. These really look and sound lovely, but where I come from we don’t get lemon pie filling. What is it precisely (I take it it’s some ready-made formula/mix for a cake) and can it be replaced with some assembled ingredients? You can sub homemade lemon curd instead. 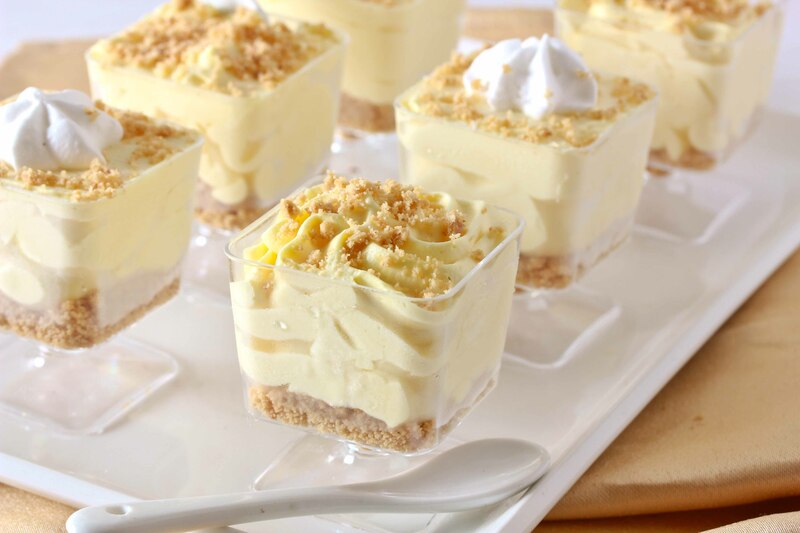 What is lemonn pie filling….is it canned or lemon meringue filling by bakers choice which comes in a box? Is the lemon pie filling from a can? I just made these – the flavor was absolutely amazing. I’m in the UK and used lemon curd instead of lemon pie filling since that was all that was available. I have a question – the texture of my filling was VERY liquidy. I thought it would set after chilling them all day but it remained the same. The taste was spot on – no complaints there, but is it intended to be so liquidy (like the consistency of a cake batter or even an uncooked cheesecake batter), or is it supposed to be a bit more firm and aerated like a mousse? Any tips would be useful! just a quick comment. it would be helpful if it has a print button like your other recipes have…. I’m working on adding the print button to the old recipes…it’s a lot work though so it’s not happening overnight! I just made these and they’re awesome! What do you think about using other flavored pie filling? Like strawberry? Hi-what kind of tip did you use to pipe these? They look delicious! Made these for an event the other night and they looked gorgeous and everyone loved them!!! I used 2 oz mousse cups and this recipe filled exactly 40 cups. I did need about double of the graham cracker part though… Thank you!! i make them last night for my baby shower which is today and they look amazing, and they taste great i’m not very fan of key lime pie but my husband is and he want me to do something like this. everything is very clear and easy to make i’m not the greatest cooker and they came out great!!! one comment to make the recipe is for about 10 to 12 of those little champage plastic glass the you can find in the dollar store so just doble or triple the ingridients if you want to make more! good luck ! I made these a while ago and they were a hit. thinking of making for shavous, but my oldest said that he didn’t like the crumbs on the bottom. do you have any suggestions for something else that would do instead? So this recipe was super easy of course and since i am making your strawberry cheesecake trifles i decided to pour this into 2 graham cracker crusts. No way to slice that of course so i froze the pies…. And it is DELICOUS!!!! Tastes like a perfect lemon freeze dessert… No my question is do i prepare a blueberry sauce or just top with crumbs or both? I love the combination of blueberrie and lemon. Thanks for a WINNER of a recipe!!! do you think this would go with blueberry pie filling instead? want to make it for a purple color scheme? Sure – blend it first to get a smooth texture. Hi we do not get lime pie filling in India.is there any other alternative to it. This recipe is fantastic! instead of lemon pie filling I used Lemon curd in a jar (Dickinsons brand). It was SOOOOOO good. I piped the filling into 2 oz glasses and was able to get about 20 desserts. Just delicious and refreshing!! These were amazing! We had similar ones at a recent wedding, and I decided I must try them. Then i saw this in your cookbook and knew this was the right recipe to try! I made them as a parve dessert for a meat meal on Shavuos. They were a hit! It made 15 desserts – in 4 oz cups. What is the equivalent of 1 cup of lemon pie filling? I have one box of the lemon flavor My-T-Fine. Its 2 and 3/4 oz. Will that work? I’m not familiar with the produce you’re talking about. If you cant get the canned stuff, you can use lemon curd. I think we eat with our eyes first … and it looked fabulous…! hi! my friend recommended this recipe. would it work in a graham cracker pie crust? and can i make it on thursday and serve it saturday? Can I make these today, Wednesday refrigerate, pipe into cups tomorrow, Thursday, refrigerate and serve on Shabbos day? You can keep these (fully assembled) in the fridge for a few days, or longer than that for in the freezer. If I made these dAiry what substitutes would I use? I can’t wait to try this recipe. I was wondering if I can use Bakers Choice Lemon cream instead of the lemon pie filling.